Is the WIC getting a kickback from the floral industry? 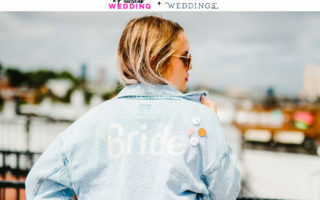 Q: I am about six months out from our wedding and I am trying to find alternatives to floral bouquets for bridesmaids. I am trying to avoid the traditional floral bouquets, however the wedding industry must be getting a pretty sick kickback from the floral industry because they are so intertwined. I feel like an alien whenever I say I don’t want a ton of flowers. We have our reasons for not wanting a lot of flowers, but these are our top three: 1) they are so expensive; 2) I really don’t like how much you waste at the end of the day (especially because we don’t live in the area and won’t be enjoying them after the wedding); 3) it’s just not our personal taste. I plan to have a broach bouquet for myself (the bride), but I haven’t had much luck searching online for alternatives for the bridesmaids. So I was hoping the APW community would have some good suggestions and examples of DIY projects or what others have done for their own non-floral-focused weddings. A:As APW’s resident/part-time floral hustler, I’ll let you in on a little secret. Flowers are just expensive. So it’s not so much that the wedding industry is getting a pretty sick kickback from the floral industry. The cost comes down to the work that goes into getting those fresh flowers grown, arranged, and to you. Costs can skyrocket if you want those pretty flowers ethically grown, and even if they’re not ethically grown, you guessed it, still expensive. For a quick breakdown, think about it this way. The flowers are grown on a farm where they need to be tended to, then cut, then packaged, then shipped (sometimes from across the country or from across the world), then delivered. And transportation isn’t where this ends. After that someone has to prep the flowers (get rid of those pesky leaves, stems and thorns), arrange them, and then get them to your wedding. So the TL;DR is that flowers are expensive because it takes many people (who need to get paid) to get those flowers in their final state to you. So that’s why flowers cost a lot. And if you’ve realized paying all that money for something you’re not that into isn’t the right choice for you, well, good job figuring that out before you wrote the check, not after. I’m sure the APW community will have plenty of creative non-floral ideas. But one of my favorite things in the past few years was this vintage brass swan planter that was filled with petals. You can use confetti instead of fake flower petals if you don’t want to spend a ton, and you can reuse the vessels after the wedding. Etsy has a huge selection of vintage planters and baskets to choose from. But that’s just one idea of many, so let’s toss it to the crowd for all their best inspiration. APW community: Have you made a bouquet without flowers? What supplies did you use? Do you have a DIY that you want to tell us about? Share your tips and tricks in the comments below!